The Schizophrenia Society of Nova Scotia has been coordinating a variety of events highlighting the creativity, diversity, and ingenuity of those living with mental health and addictions challenges. These Mindful Art events have been made possible by funding provided by the Nova Scotia Department of Culture and Heritage’s Forward 150 Fund. These events have included Mindful Art windows highlighting shaping healthy communities, a Mad Hatter Tea Party highlighting Mad Pride, and a Spoken Out, spoken word event that brought out a variety of passionate and talented spoken word artists. 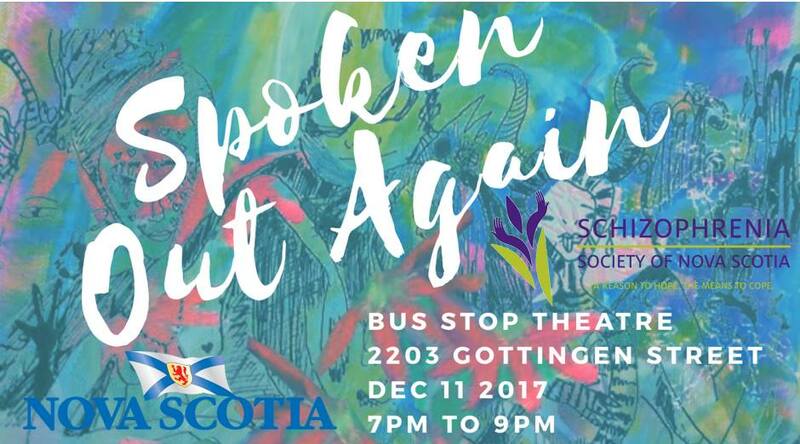 On behalf of the Schizophrenia Society on Nova Scotia, I would like to invite you to our last official Mindful Art event happening on December 11, at the Bus Stop Theatre (2203 Gottingen St, Halifax) from 7 pm to 9 pm. Due to the extreme success of the Spoken Out event in August, we will be presenting Spoken Out Again. We encourage you to come and share in celebrating the passion, creativity and courage of all who are performing. While this is our last official event under the grant of the Mindful Art Initiative we hope to continue these events in future as they have brought together people from all walks of life and have demonstrated the bright future for those living with mental health and addictions. We hope to see you there!